Grand Pearl Co., Ltd. was established in November 27, 1990 by Mr. Pichit Kulkeatdech with the vision to showcase customers the brilliance of the Chao Phraya River with grace and luxury. 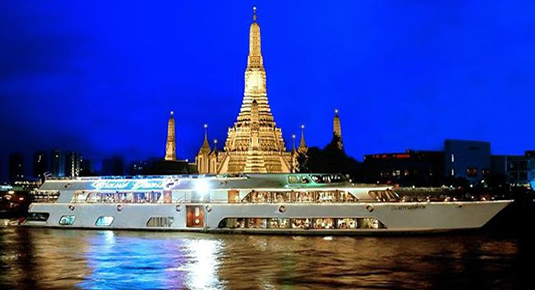 During our 20 years of operating in the River Cruise Industry in Bangkok, we established a number of successful programs and events; such as Candle Light Dinner Cruises, Ayutthaya Tours and all day events chartered by domestic and international corporations as well as private parties. “Grand Pearl Cruses.” has organized various corporate reunions and international promotional events for the trade and fashion industry. Moreover, our overseas clientel have brought us repeat businesses, thereby certifying that our products and services meet international recognized standards of Travel Agencies and Tour Operators from around the world. Be enchanted by memorable sceneries over lunch or dinner as you enjoy our exquisite Thai and International buffet line. Whether sipping a refreshing cocktail prepared by one of our world-class bartenders or treating yourself to a glass of fine wine sourced from a selected group of exclusive vineyards from around the globe. You are bound to be taken by the serene atmosphere on top of our panoramic open-air deck. The warm services provided by our well-trained and experienced staff is second to none, and is complemented by the ambience of live music of various genre performed by talented Thai and International artists accompanied by our state-of-the art entertainment systems. Glide through the ages, discovering ancient and modern architectural landmarks along the banks of the River of Kings that Bangkok has to offer.